Rezone the property from residential(R7.5) to commercial. The meeting is at City Hall on Monday December 20 at 10:00 am. For more information, call Lonnie Warren, City Coastal Zoning Inspector at 385-8246. We are very concerned about this new information about commercial rezoning and barge spoil dredge site! Does anyone else feel that this additional project is being “pulled in” past our complete knowledge of it? How is this going to effect our community? I know Dec 20th is a bad time for a meeting with it being so close to the Holidays, but it is the future of our neighborhood. I hope others will come the meeting too. 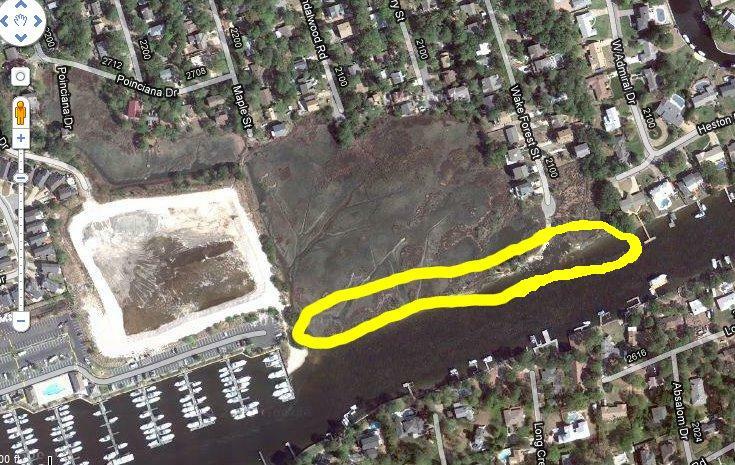 Long Creek is so congested on weekends now and adding more piers and boat slips is just asking for trouble. and moving that channel 35 feet closer to Bay Island is a joke. What are the people at City Hall thinking. And the change to commercial from residential means the city cares more about the money than it does its residents .